The Long Pointer is published 4 times a year: March, June, September, and December. The March, June, and September issues are available only online. The December issue is available online and is also printed in an abbreviated form and mailed to all Long Point residents and land owners. Should there be a call for a change to the community bylaws, a special mailing will be produced and sent to all community residents and owners. 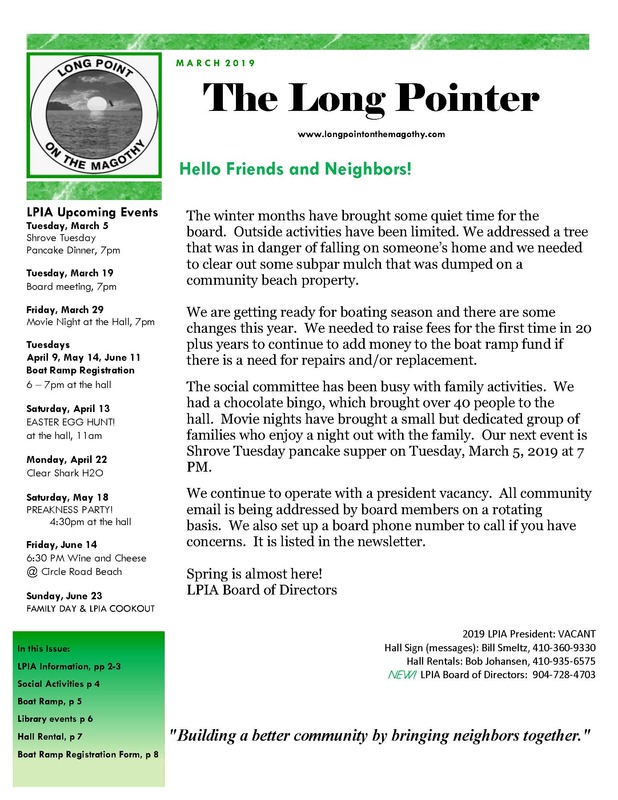 Get on our E-mail List: If you would like to have the quarterly newsletter e-mailed to you, as well as any special notices, simply send an email to webmaster@longpointonthemagothy.com or use the Contact Us form. Note: The newsletters are in Adobe Acrobat format (.pdf). If you do not have the Adobe Reader, it is available free of charge from Adobe. Just click the icon on the right to go to their site for the download.